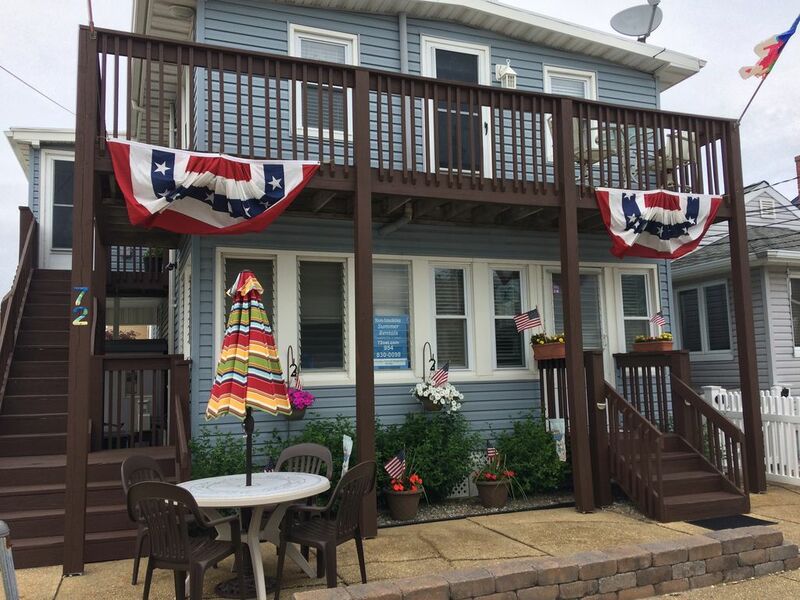 Smoke Free Family Summer only Rental - 72 O Street, Seaside Park. The Downstairs apartment is a 3/2, sleeps 6 (3 queen beds), 2 AC's & ceiling fans, Full kitchen, 2 - Satellite TVs, Wireless Internet , private backyard, 2-gas grills, outdoor shower, washer & dryer access, 2 beach badges included with rental. Owner on site at all times. Great location, great host/hostess, great accommodations (roomy, with utensils, dishes, towels and even high speed internet access), great vacation! Only suggestion would be more air conditioning units. This was our 2nd summer at the cottage and we love it. It is very clean, roomy, you have everything you need, close to the beach, boardwalk, its even great to be able to go to new york city or Philadelphia for the day. The Host and hostess are the kind of folks you would want staying in your home, we want to consider this our yearly family tradition and hope the cottage will always be available for many years to come. This unit is very clean, it is also on a clean and quiet street.Close to the beach and boardwalk.Great house for the family. Easy access from and to R37. Hope to use this unit again. My family and I love it here! We have been coming for the last few years and plan on going back every year. The apartment is very clean, the hosts are wonderful and the location is perfect! You're close to the beach, bay, boardwalk and Rt 37! I can't wait for the summer of 2009!! 3rd Generation owners. This house were originally built in the early 1940’s by Harry & Ada Conti. Both families immigrated to the United States when they were young children. They were proud, hard working people who appreciated the opportunities this country offered. Through out the years, there were 4 properties, 72 O Street was the original. We are proud to be third generation Conti’s on the Jersey shore. Throughout the years, our family has been blessed with many fond memories of “summers down the shore”. We hope you enjoy your time here and take home your own fond memories. This is our summer home and we enjoy being able to share it with other families that want a quality shore vacation. On site for all rentals (upstairs apartment) ensuring a quality rental. Linens & Towels....$ 95.00 per week. Fully supplied kitchen. Carpeted throughout. Very clean. Optional Services: Linens & Towels .......$95.00 per week. Optional Cleaning Service....$175.00 per visit. Beach Umbrella w/anchor...$ 25.00 per week Wonder Buggy............$ 30.00 per week Beach Chair.................$ 5.00 per week Beach Badges - 2 Included with rental Additional Badges $ 30.00 per week $ 5.00 per day These are self service rentals, no maid service. Washer & Dryer room is available daily free of charge. I am a 54 year old women. I have been going to the Jersey Shore every single summer of my life since the age of 5. I have stayed in every town, in every type of house. This was by far the worst house, the worst experience, and the worst owners I’ve ever encountered before in my life. First and foremost.. when I arrived at this house there were 2 Valium pills (I have pictures, wish I could post them here!) sitting on the kitchen counter. All I could think was thank god I had no young children in the house. Second of all.. this listing advertises an outdoor sitting area and a barbecue. What it DOESNT mention is that you share the outdoor sitting area and barbecue with the owner, AND the people renting the back house. Third of all.. these owners never left us alone. They sat on top of us the entire trip which was extremely odd and uncomfortable. My family and I went on vacation to relax, not to feel like we are being babysat. Forth of all, this owner refused to give me back my security deposit. I smoke, however I rented this house fully understanding that there was a “No Smoking” policy. Honestly, I have never stayed in a house that allowed smoking and I don’t even smoke in my own house so I didn’t think this would be a problem. However, after I left, the owner accused me of smoking in the house, which resulted in my security deposit not being refunded. I did not smoke in the house. I didn’t even smoke outside of the house. I did nothing but obey her rules. For her to accuse me of this and take my money just proved to me that she was not only a liar, but a scammer. Whoever wrote all the other reviews must be family members because I can assure you, as an honest stranger, these people are crazy and I have never stayed in a worse house down at the shore before in my life. DO NOT STAY HERE. SAVE YOURSELF THE STRUGGLE. In the 20+ years that I have been renting, I have learned that a bad review has 2 sides. I will be happy to address each issue. The security deposit was returned – in full. Had the smoking rule not been broken, they would have received a credit for a future rental. Unfortunately, this renter had to leave after only 2 days due to a family emergency, which they failed to mention. There was never a mention of finding pills. There are 2 outdoor sitting areas, front and back, I do not share or use them when renters are present. There are 2 grills, neither which this renter used. There is an outside upstairs balcony where I sit & eat, there was never an intention to “sit on top” of anyone. We try our best to give renters privacy and interact only when they initiate. After departing, my husband went to lock the unit. He called me to confirm his finding, that someone had smoked inside the middle bedroom and front bathroom in the unit. The odor was so strong and evident that I, being very allergic to smoke, I had to immediately exit the unit. It took 3 days to remove the odor. Again, the security deposit was returned in full. No family members have ever written reviews of the property. Everything was fine and clean, convenient to the boardwalk, area restaurants and stores. Real quite area and there was plenty of parking around the home. My wife would have liked to have an ironing-board and iron in the apartment. Otherwise all was great thank you Celia and Jim. The place wasn’t fancy, but it was clean and in a good location. Celia and Jim were responsive hosts. Overall we had a great time. The Jersey shore is a special place for families and friends to share a simple vacation. Days on the beach or bay, nightly walks on the Boardwalk, bar-b-ques and a love of being outdoors. Having a clean rental with a great location is a plus. I've always said, for myself, I can put up with other issues as long as the unit is clean. As hosts, we strive to offer a clean comfortable and reasonably price rental for the shore. I'm glad to hear that Nina was happy and hope they will return. We are a family of 5 from Jersey. We rented from the Conti family with no referrals. Our family was more than satisfied with the spacious layout and cleanliness. Jim and Celia (owners) gave us our privacy and were available to us when we needed them. I can't wait to rent this place again!!! It was a perfect place & a great location! Having 2 bathrooms was a bonus! Super nice hosts! We will rent again!! It's always good to see a family come and enjoy the shore. We strive to make and everyone comfortable and offer a quality family rental. Thanks for the great review! 1.5 blocks to the Ocean or Bay. 3 Blocks to the Boardwalk - 5 miles long with 1 mile of amusement rides(adult & kiddie), wheels of chance, restaurants(casual & fine dining), bars, dance clubs, fire works every Wednesday. Run, walk, water ski, para-sail, surf, jet ski, fish, kayak, canoe, cycling, roller-blading, golf. Island Beach State Park (nature preserve) is only 2 miles at the end of the Island, offering guided of self guided trails. Atlantic City (buses available)only 45 min. away. Great Adventure Theme Park, Horse Racing, Vintage Car shows weekly, Antiques, shopping, outlet malls & New York City only 1 hour north. Or simply relax and enjoy the sun, sand & ocean breeze. Several churches within walking distance. Saturday to Saturday No Groups; Teen, Prom, College or Young Adult No Pets Owner on site for all rentals. Absolutely no smoking of any kind on premises including any and all vapor products.